As you know I currently purchased a very large amount of peaches which I had to find a proper use for. I love peaches, I am always somber when I know their season is coming to a close. Thanks to some simplistic methods I discovered, this year I will not have to bid them a bitter goodbye. Preservation time! Get those peaches prepped for future culinary pleasure. Though when eating a peach out of hand I greatly appreciate the fuzzy texture of the peach skin, when freezing peaches the skin tends to separate from the flesh and creates long stringy pieces of skin in your pies, cobblers, etc. This can be easily prevented by blanching. Blanching is not some archaic, highly intensive process, it just sounds fancy. I personally think that blanching can be a lot of fun. Unfortunately, I lack pictures of this process due to the fact that I was doing it at 12am. Needless to say the lighting was bad and my hands were covered in peach guts. Honestly though, this process is so easy we shouldn’t need pictures. Let’s get started! Bring about 3 quarts of H2O to a boil in your largest pot. Fill your sink or a large bowl with cold water and ice cubes, we need it cold, really cold. Drop 1-2 peaches in the boiling water for 30 seconds then move to the ice water for 30 seconds. Using a kitchen towel or wash cloth rub the skin off the peach. Easy!!!! Just a bowl full of naked peaches. After you have finished blanching your bounty you can halve, quarter or slice the peaches. Next, lay the slices out on a sheet pan and place in freezer for about 20 minutes, or until just frozen. This will keep the peaches from turning into one big block. Remove from sheet pan and store in freezer bags. When you are ready to use them. defrost for about 15 minutes. They can be used in smoothies, pies, and pretty much anything else. 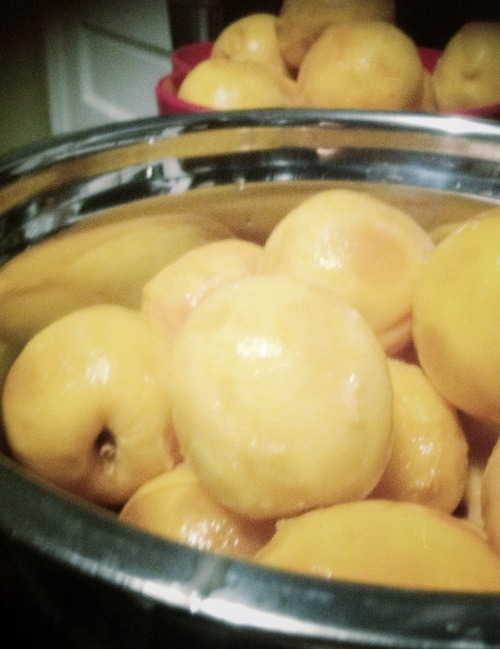 Peaches in December, YAY! Enjoy!